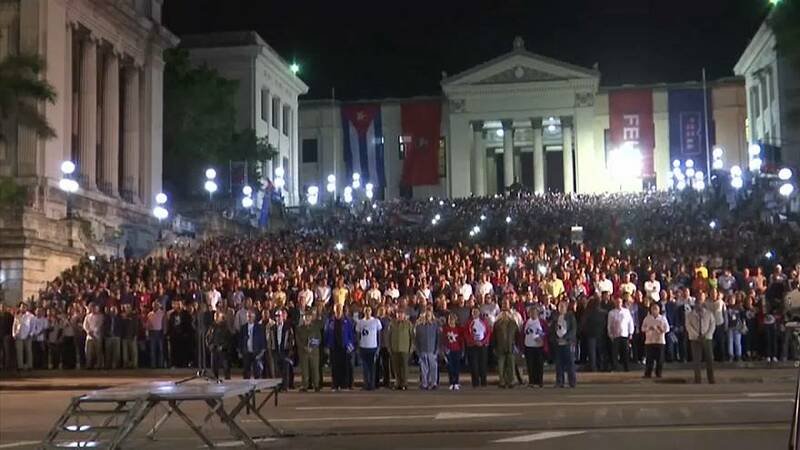 Thousands of students and Communist Party militants staged a torch-lit march in Havana on Saturday, in commemoration of the 165th anniversary of the birth of independence hero, Jose Marti. Marchers carrying torches and flags surrounded the street at the entrance of the University of Havana, with top Cuban government officials leading the way. The Cuban government reported similar marches in major provincial capitals throughout the country, including the easternmost city of Santiago. President Raul Castro, flanked by Vice President Miguel Diaz Canel, led the procession of thousands of torch-carrying marchers though central Havana, with a huge banner of deceased revolutionary leader Fidel Castro hanging on a nearby building. The procession included party militants and some military cadres, but was mostly comprised of students from the University of Havana, with some paying homage to the past, but saying they hope for more progress in the country. President Castro is due to step down from power in April - which could leave the island governed by a leader not named Castro for the first time since the 1959 revolution.